It's very abstract and it kind of looks like colors are exploding out of a rock or something. I really like the color combination and above all else, it's super easy to do! These were just the colors that I chose, but you can obviously pick any colors that you want. Also there are so many different brands of nail polish that produce nail polishes with the crackling effect, you are not limited to OPI. So again, the purpose of my blog is to just give you inspiration to create nail art with tools and colors that you already have. Use the aqua nail polish, paint a small section near the middle at the tip of your nails. This should take about 1/3 of your entire nail. 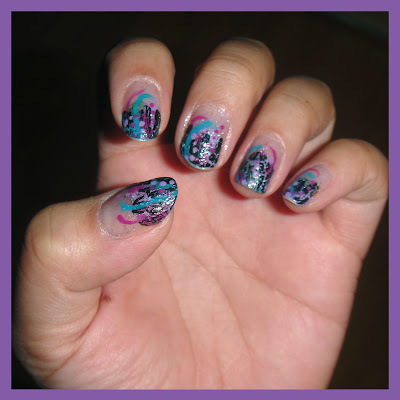 Using the magenta and light purple nail polishes, paint on the left and ride side of the aqua section. Allow it to dry. Using a black crackling nail polish, paint three small stripes on the tip of the finger. This should take about half your nail. Allow the nail polish to slowly crack. Next using a striper tool, create two long curved line using the magenta and aqua nail polishes. Either use a striper tool or a dotter to create varying sized light purple and magenta dots. Paint over your nail with glitter nail polish with a clear base. Try to spread more glitter near the art work. Finally, place a top coat and allow it to dry. I think I'm going to keep all my nail art pictures colored rather making it black and white. I think it looks better that way. Anyways, I hope you enjoyed today's nail art! Pretty! Have you ever seen space nails? I keep looking for a nice black matte nail polish to do the base of the space nails, but no luck. There's matte coating, you should give that a try. I never used it before though.